NFL Thursday night games are, for the most part, trash. Teams are understandably not fully prepared, still healing from their previous contest just four days prior. It’s very easy to understand why players might not be putting their best foot forward when taking part in a Thursday nighter. The Cleveland Browns sure better be ready to do so. They take the field tomorrow night in a Week 3 game which could completely alter where their season goes from here. Cleveland enters the contest with an 0-1-1 record. Had the team received better kicking (or had the head coach been aware his kicker was playing with a groin injury), it could be 2-0. The Browns’ opponent, the New York Jets, is an easier match-up when compared to their previous weeks’ opponents in the Pittsburgh Steelers and New Orleans Saints. While rookie QB Sam Darnold shows promise, Cleveland’s defense should fare better against him knowing it played well against Ben Roethlisberger and Drew Brees. Bottom line – this game is winnable for the Browns. Hell, you could argue they should come out victorious. At least, that’s what I’d hope. Their season is currently at a fork in the road, and how this game plays out will determine so much when it comes to the rest of the year. A win puts this team in a great spot moving forward. A loss would open Pandora’s box. Let’s say the Browns pull off a victory over New York. This would mean the monkey would finally be off their back, as they’ll have notched their first win in almost two years. The Browns would also be 1-1-1, looking especially competitive against teams which would’ve ripped them apart in years past. Add in the fact they’d have ten days to prep for a west coast trip to face a badly struggling Oakland Raiders team, and suddenly they’re looking at a chance to be 2-1-1 a quarter of the way into the season. I think if anyone told us Cleveland would be above .500 after Week 4, we’d have taken that outcome in a heartbeat. Personally, I think this team has played well enough that, once it finally gets the first win out of the way, it could start trending upwards in a hurry. This is assuming it comes out victorious on Thursday. If the opposite happens, if the Browns lose again…dear God in heaven, it could get ugly in a hurry. For Cleveland to look so vastly improved this year and be three weeks into the season with a tie as its only bragging point would be a letdown of epic proportions. The Browns would then have ten days asking themselves just one question – why the hell can’t we win a game? A loss Thursday will also add fuel to the biggest narratives surrounding this team. 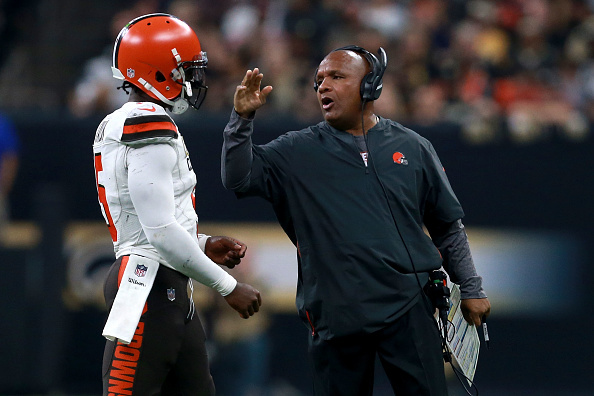 Fans and media alike will clamor for one of two things to happen in the time before the next game – start Baker Mayfield at quarterback or fire coach Hue Jackson. Nothing current QB Tyrod Taylor has done would merit a Week 4 benching. Likewise, a midseason firing of Jackson could arguably create more chaos for a team which has been full-up on it for years. Still, this won’t stop the calls for either scenario, or both. This, when combined with the sure-to-be mounting frustration which would come with yet another failure to win a game, could create a powder keg situation in Cleveland. No team comes into Week 3 with its season in the balance. The Browns, however, are a unique case. They look better than they have in years, and are still looking for their first win since 2016. Should they achieve it Thursday, it could finally get this team going in the right direction. Should they come up short, we can go ahead and prepare for the annual Cleveland chaos to ramp up to full swing.